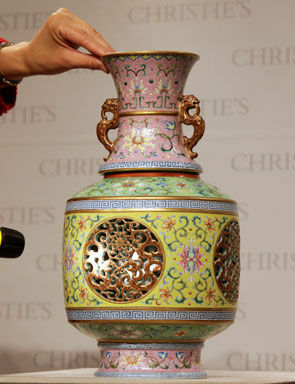 A specialist from Christie's auction house introduces a Famille Rose revolving and reticulated 'Chilong' double vase. EPA/YM YIK. HONG KONG.- Christie’s Hong Kong Spring sales of Important Chinese Ceramics and Works of Art, to be held on Wednesday, 1 June at the Hong Kong Convention & Exhibition Centre, will present over 450 rare and exquisite Chinese Imperial ceramics and works of art valued at close to HK$1 billion, which is an increase of almost 60 times Christie’s first sale of Chinese Ceramics and Works of Art in Hong Kong in 1987. Offering global collectors unprecedented breadth and depth, the sale this season is the perfect place from which connoisseurs can acquire the rarest and the best. 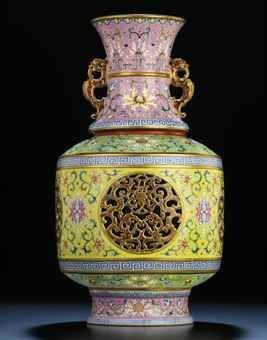 Leading the sale is an exquisite revolving vase from the Qianlong period (1736-1795) (estimate on request). Preserved in perfect condition, the rotating vase has reticulated outer walls and painted interiors, with a complex form and structure that exemplifies the technical brilliance of the craftsmen at the Imperial kilns of the period. The vase, intricately decorated inside with symbols of happiness, longevity, prosperity and joy, is a tour de force of artistic and technical achievement, skilfully combining archaism, novelty and exquisite taste. 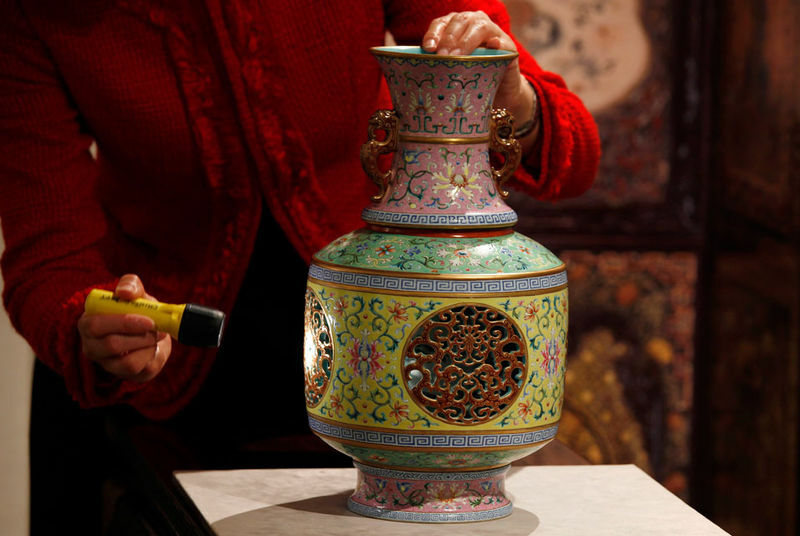 As few reticulated revolving vases were successfully produced in China at the time, it is not surprising that even fewer surviving specimens are found today. 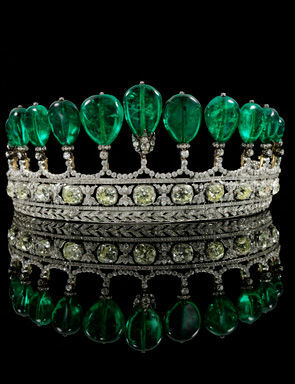 Christie’s is privileged to present collectors with this once-in-a-lifetime opportunity to acquire such a work of spectacular beauty and ingenuity at its Hong Kong Spring sale. 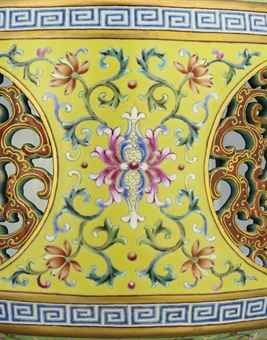 This vase is a remarkable example of the technical ingenuity and skill of the craftsmen at the Imperial kilns in the reign of the Qianlong Emperor. Imperial porcelains from this reign are universally admired for the extraordinary skill that they demonstrate, and on the 17th day of the 5th month of the 8th year of Qianlong's reign , the famous ceramicist and Superintendent of the Imperial kilns Tang Ying (1682 -1756) presented the first revolving porcelain vessel to the emperor. 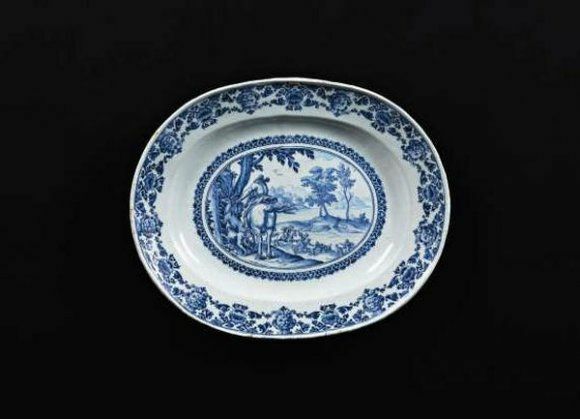 Even Qianlong, whose passion for ceramics and novelty led him to make exceptional demands of the potters at the Imperial kilns, and who took innovation and technical excellence for granted, would have been fascinated and impressed by this new invention. The vessel presented to him was a winter green bowl (fig. 1) which revolved on its stand, and the event is recorded in Qianlong jishi dang (Archives of Qianlong Memoranda, reproduced by the National Palace Museum in Qing Kang Yong Qian mingci, Taipei, 1986, p. 193). The emperor's approval of this innovation may be assumed, since there were imperial orders for revolving vessels - bowls and vases - in the 8th, 11th, 12th, 18th and 22nd years of Qianlong's reign , although on receipt of the first bowls the emperor is recorded as having ordered that they should only be made for special occasions, in sets of ten. The bowls which revolved on their stands, such as those preserved in the National Palace Museum, Taipei (illustrated in Qing Kang Yong Qian mingci, pp. 163-4, nos. 136-7) probably inspired brush pots which rotated at a horizontal junction half way down their cylindrical form. The brush pots were decorated with double gourds, containing the 12 Celestial Stems above the junction and the 12 Terrestrial Branches below the junction, so that rotating the upper section to align different Stems and Branches allowed the formation of the names for the whole 60 year cycle. A brush pot of this type in the collection of the National Palace Museum, Taipei is illustrated, ibid., p. 167, no. 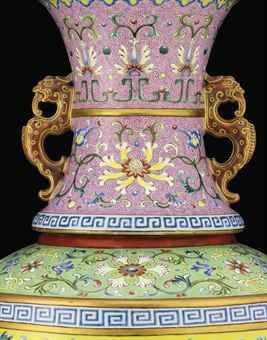 140, and a similar example in the Palace Museum, Beijing, is illustrated in Porcelains with Cloisonne Enamel Decoration and Famille Rose Decoration, The Complete Treasures of the Palace Museum, 39, Hong Kong, 1999, pp. 162-3, no. 144 (fig. 2). While intriguing, the rotating bowls and brush pots, were relatively simple compared to rotating vases like the current example with more complex form, reticulated outer walls and painted interiors. It seems most likely that the first rotating vases did not have reticulated decoration, but had simple revolving sections, like the double gourd vase on a pale celadon stand, enamelled in imitation of bronze, decorated with bats, and topped by an open lotus flower, in the collection of the National Palace Museum, Taipei (illustrated in Emperor Ch'ien-lung's Grand Cultural Enterprise, Taipei, 2002, p. 174, no. V-8). Such vases would not have been easy to make, but those with reticulated outer walls revealing decorated interior walls, like the current example, would have been much more challenging, and represent astonishing technical mastery. As can be seen from fig. 3, the current vase is constructed so that the neck and inner cylinder are constructed as one piece, while the reticulated outer walls, base, and foot form the envelope within which it revolves. A porcelain cone placed in the centre between the bases of the outer and inner sections provides the pivot on which the latter is able to rotate. It was necessary that no part of the vases should distort during firing; that all the sections should shrink the same amount in the firing; and that the revolving section should not become stuck to the rest of the vase during or after the assembly process. This would be a tall order for a vase that was only fired once, but the current vase and other similar vessels, such as those preserved in the imperial collections, are decorated in enamels, which required an additional firing at a lower temperature. 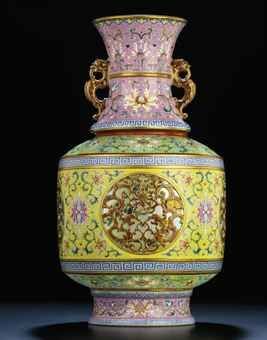 It is not surprising therefore that so few of these revolving vases have survived to the present day, since the extraordinarily difficult manufacturing process meant that relatively few were successfully made, and their production appears to have been restricted to the Qianlong reign. Not content with making a vase that revolved, the ceramicists who produced the current vase added a further degree of difficulty to their task by piercing the outer shell in order to create a reticulated pattern and to allow the decoration of the inner wall to be seen. The design of the reticulated roundels in the outer shell had to be very carefully balanced so as not to result in distortion or collapse of the outer wall during firing. A number of the surviving revolving vases have reticulated outer walls with relatively simple openwork areas in the form of the Eight Trigrams or C-scrolls. One such yellow ground revolving vase with interlocking cloud collar and reticulation in the form of the Eight Trigrams is in the collection of the National Palace Museum, Taipei, and is illustrated in Emperor Ch'ien-lung's Grand Cultural Enterprise, 2002, p. 191, no. V-27 (fig. 4). A revolving vase with painted trigrams and simple scroll reticulation in the collection of the National Palace Museum is illustrated in Qing Kang Yong Qian mingci, p. 161, no. 134, while a revolving vase in the collection of the Palace Museum Beijing has the same simple scroll openwork cut into a cong-shaped outer shell with Ge-type glaze (illustrated in Selected Porcelain of the Flourishing Qing Dynasty at the Palace Museum, p. 342, no. 78). A further reticulated vase with simple openwork in the shape of the Eight Trigrams is in the collection of the Victoria and Albert Museum, London is illustrated in China - The Three Emperors 1662-1795, London, 2005, p. 295, no. 220. The same publication illustrates a revolving vase with much more complex openwork landscape, sold by Christie's London on 15 June 1999, lot 99, now in the Lin Jian Wei Collection (ibid., p. 297, no. 222) (fig. 5). A Qianlong rotating lidded vase from the Imperial collection, with dark blue ground and pierced landscape roundels on the outer wall, is in the collection of the Nanjing Museum (illustrated in Zhongguo Qingdai guanyao ciqi, Shanghai, 2003, p. 319). Further reticulated revolving vases of various shapes, but all with finely cut openwork, are in the collection of the Palace Museum, Beijing, illustrated op. cit., 1999, pp. 174-9 and 162-3, nos. 155-9 and 162. Of these, the vase with elephant head handles, illustrated as no. 156, has finely cut archaistic chilong openwork roundels similar to those on the current vase, while the vase illustrated as no. 157 has similar archaistic kui dragon handles. A blue and white vase in the National Palace Museum, Taipei has revolving reticulated outer shell with celadon glaze decorated in gold enamel (illustrated in Qing Kang Yong Qian mingci, p.159, no. 132), while a similarly coloured outer shell appears on a double-walled vase, which does not revolve, in the Palace Museum, Beijing, (illustrated op. cit. 1999 p. 181, no. 161) (fig. 6). A reticulated revolving vase in the collection of the Shanghai museum has openwork medallions depicting dragons (illustrated in Exhibition of Ceramics throughout China's History from the Shanghai Museum, Tokyo, 1984, no. 98) although the style of the dragons is somewhat different to those on the current vase. A reticulated Qianlong vase of similar lantern shape to the current vase is in the collection of the Tokyo National Museum (illustrated in Special Exhibition - Jixiang - Auspicious Motifs in Chinese Art, Tokyo, 1998, p. 283, no. 247). The Tokyo vase also has handles in the form of archaistic kui dragon similar to those on the current vase, although painted only in gold, rather than red and gold. On the Tokyo vase the reticulation forms a lattice encircling the exterior wall, with inset roundels of cash and ruyi, while the interior is decorated with bats amongst clouds (fig. 7). Diagrams have been published showing two very different construction techniques used in reticulated revolving vases. A diagram showing the construction of the vase with elephant-head handles preserved in the Palace Museum, Beijing, is published in Treasures of the Forbidden City, (Zhu Jiajin chief compiler, consultant editor G. Hutt), Harmondsworth, England, 1986, p. 182, where a step-by-step description of the construction process is also given (figs 8A & 8B). Diagrams and description of the workings of a vase in the Palace Museum, Beijing, with fretwork edges to the pierced roundels, is provided in op. cit., 1999, p. 182, no. 162. This vase has a separate turning mechanism for the interior cylinder, and includes a complex additional structure inside and under the cylinder. While a significant number of imperial Qianlong porcelain vessels with enamel decoration have single coloured grounds with feather-like scrolls incised through the enamel in sgraffiato style, rather fewer have these delicate scrolls painted onto the ground in a slightly darker colour, which would have been an even more skilled and time-consuming technique. This painted technique has, however, been used on the pink ground areas of the current vase. Similar delicately painted scrolls can be seen on the pink areas of a predominantly yellow ground Qianlong falangcai vase in the National Palace Museum, Taipei (illustrated in Qing Kang Yong Qian mingci, p. 146, no. 120), and on the pink foot and neck of another Qianlong revolving vase in the Palace Museum, Beijing, illustrated op. cit., 1999, p. 178, no. 158 (fig. 9). A covered Qianlong bowl in the collection of the Nanjing Museum is decorated with floral scrolls and archaistic kui dragons on a pale pink ground with darker pink feathery scrolls (illustrated in Zhongguo Qingdai guanyao ciqi, Shanghai, 2003, p. 281). A teapot in the collection of the Palace Museum, Beijing has panels reserved against a ground of dark pink scrolls on a pale pink ground (illustrated in Selected Porcelain of the Flourishing Qing Dynasty at the Palace Museum, Beijing, 1994, p. 300, no. 32). Delicate dark pink scrolls on light pink also provide the entire ground of a Qianlong teapot in the collection of C. P. Lin, illustrated by R. E. Scott in Elegant Form and Harmonious Decoration - Four Dynasties of Jingdezhen Porcelain, London/Singapore, 1992, p. 165, no. 190. The same publication illustrates a sedan chair vase from the collection of Sir Percival David bearing a Qianlong poem in a panel reserved against a pale blue ground with delicate dark blue scrolls (p. 164, no. 189). This sedan chair vase is interesting as surviving documents exchanged by the Qianlong Emperor and Tang Ying suggest that the prototypes for such inscribed vases were made in late 1742, with additional vessels to be ready for the following spring. This would be 1743, the same year in which the first revolving porcelain vessels were presented to Qianlong. Darker blue scrolls on a pale blue ground also appear on the rotating brush pot in the National Palace Museum discussed above. Archaistic kui dragon handles, like those on the current vessel can be seen on a number of imperial porcelains from the Qianlong reign - both blue and white and enamelled wares. A blue and white flattened lobed flask in the collection of the National Palace Museum, which has similar handles, is illustrated in Emperor Ch'ien-lung's Grand Cultural Enterprise, 2002, p. 170, no. 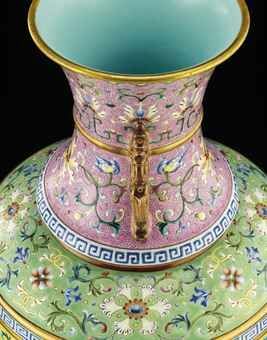 V-2, as is a Qianlong vase with winter green glaze and blue floral decoration (illustrated in the same volume, no. V-23). 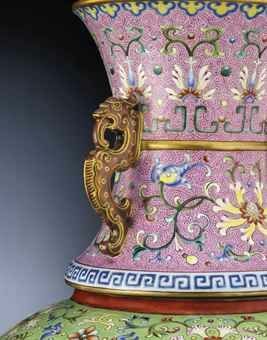 Similar kui dragon handles, in the same red and gold palette as on the current vase, appear on a Qianlong vase with turquoise ground decorated in cloisonne style in the Palace Museum, Beijing (illustrated Porcelains with Cloisonne Enamel Decoration and Famille Rose Decoration, 1999, p. 136, no. 119), while slightly heavier versions of this type of handle can be seen in red and gold on a large 'hundred deer' vase also in the Palace Museum collection (illustrated ibid, p. 98, no. 85), and in blue and gold on another 'hundred deer' vase in the Nanjing Museum (illustrated in Zhongguo Qingdai guanyao ciqi, Shanghai, 2003, p. 290). 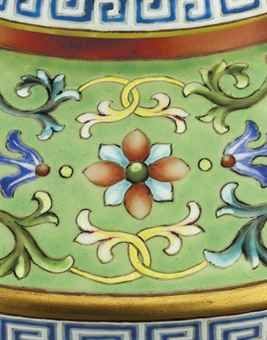 The painted enamel decoration on the revolving inner section of the current vase is beautifully executed, and conveys an auspicious message. It comprises twelve magpies. The word for magpie in Chinese is a homophone for joy and thus twelve magpies provide a rebus for shishi baoxi 'happiness announced at all hours of the day' - since the Chinese day was traditionally divided into twelve hours, each equivalent to two Western hours. The theme of twelve magpies was a popular one in the Qianlong reign and can be seen on a Qianlong vase decorated in underglaze blue and overglaze enamels in the Baur Collection, Geneva (illustrated by J. Ayers in Chinese Ceramics in the Baur Collection, volume 2, Geneva, 1999, pp. 124-5, no. 233). Accompanying the magpies in the decoration on the current vase are pine trees, rocks, Buddha's hand citron and lingzhi fungus. The pine is regarded as a noble and venerable tree, and is symbolic of longevity, as are the rocks. The lingzhi fungus or fungus of immortality is also a symbol of long life, while the Buddha's hand citron - foshou in Chinese - provides a rebus for blessings or riches, and also longevity. The message of the decoration can thus be summarized as 'may you be blessed with continuous joy and boundless longevity'. It is interesting that the auspicious message of this vase is conveyed on the inner, revolving, section of the vase. This 'hidden' message would only be seen by those who examined the vase closely, and perhaps the intention was that the auspicious wishes were for the owner of the vase alone. The message provided by the decoration on the exterior walls of the vase was more public. The elegant scrolls on a pink ground at the foot and upper part of the neck of the vessel, and on a lemon yellow ground between the reticulated roundels of the outer wall of the vase are hibiscus, which in Chinese are mufurong, providing a rebus for 'wealth and glory'. This vase is a tour de force of artistic and technical achievement, skilfully combining archaism and novelty. It is interesting to note that in 1743, the same year in which the first revolving vase was presented to the Qianlong Emperor, the Superintendent of the Imperial kiln, Tang Ying, received a summons from the emperor to return to the capital, where he was given twenty illustrations of porcelain manufacture and required 'to arrange the illustrations in their proper order, and to describe carefully the different processes illustrated in the water-colour pictures, ... and finally to return the pictures, with the descriptions which he had written attached, to the imperial library' (translated in R. Tichane, Ching-te-chen - Views of a Porcelain City, Painted Post, New York, 1983, p. 131). In his description of illustration number 12, entitled 'Fashioning and Painting of Vases', Tang comments: 'In copies from antiquity artistic models must be followed; in novelty of invention there is a deep spring from which to draw.' (ibid, p. 154). The current vase perfectly exemplifies these tenets. Another highlight of the sale is a magnificent ten-fold ‘Dragon and Clouds’ screen measuring an imposing 9 ft 5 in. x 20 ft [2.9 m x 6.1 m]. Incorporating the finest work carving, kesi weaving, lacquerwork and painting, the rosewood screen is believed to have been made by special commission for the celebration of an Imperial birthday, possibly for the Emperor Kangxi’s sixtieth birthday in 1713, or the planned birthday of his son the Emperor Yongzheng. As no other imperial screen decorated with this wealth of materials and techniques has been published, the appearance of this extremely rare work at auction offers collectors an opportunity to acquire a truly magnificent masterpiece. A wide range of fine and rare Chinese works of art will also be presented, including Imperial Ming and Qing ceramics, superbly crafted lacquer, jades and Buddhist art, as well as highlights from some of the world’s most important collections, such as the collections of Mr. Robert Chang, Baron James de Rothschild, Dr. Elizabeth Shing and a European private collector.